In Out In Left Field: Systematizing in different dimensions: the linear, left-brained thinker, Katherine Beals posted a link to Simon Baron-Cohen’s Systemizing Quotient test, which purports to measure how systematic people’s thinking is. The test scores show a distinct difference between male and female responses, but Ms. Beals points out that this bias may be built into the test in the choice of topics asked about, rather than in the people being tested. Note: the test appears to be the real instrument taken from Simon Baron-Cohen’s recent book The Essential Difference: Men, Women and the Extreme Male Brain, not an amateur rewrite. Other tests from the book are also available on-line. I took the on-line test, and as always with psych tests, I found that the statements to agree or disagree with were poorly worded, and I was torn between replying to the prompt as written or as the author of the test intended. Another example of a difficult statement to agree or disagree with: “When I’m in a plane, I do not think about the aerodynamics.” Well, the first few times I flew I did think about aerodynamics, but there’s not much new for me to think about there now, unless I got into designing new aircraft, which doesn’t interest me much. On the other hand, if I were to take an unfamiliar mode of transportation (hovercrafts, for example, or helicopters), I would be thinking about the technology involved. So is this question about my thinking in familiar or unfamiliar environments? Should a test like this make social-class assumptions about how commonly the test subject flies? The sloppiness and fuzziness of the wording of psych surveys always irritates me profoundly, which probably tells you more about my “systemizing quotient” than the test itself is capable of. Incidentally, the scores I get on the on-line Systemizing Quotient and Empathy Quotient surveys are typical for people with Asperger’s Syndrome, but the Autism Quotient, while above average, was below the level usually seen with Asperger’s Syndrome. I don’t know whether or not I have Asperger’s Syndrome, never having been professionally diagnosed, but some of the informal descriptions I’ve seen do fit my personality. I have read Tony Attwood‘s The Complete Guide to Asperger’s Syndrome, which was loaned to me by a student who did have that diagnosis, saying that the book had the best description of the syndrome he’d found—some of the description there fits me, but not perfectly. I suspect that different psychologists would differ about whether to give me the label or not. 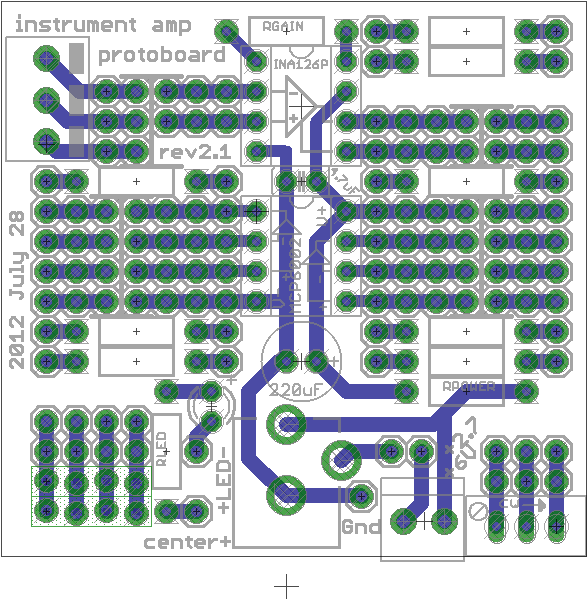 Revision 2.1 of the instrumentation amp protoboard. This version allows the screw terminals for Gnd input to be disconnected from the board Gnd when a barrel connector is plugged in, or not, depending on jumper wires. 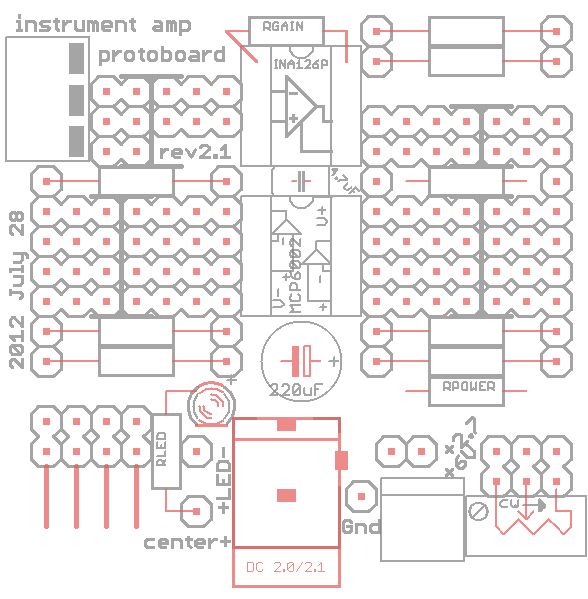 In Instrumentation amp protoboard, I showed an earlier draft design for the instrumentation amp protoboard. After tweaking the design a bit, I think I’m ready to try fabricating it. I’m planning to try fabricating through iteadstudio this time, since they have the cheapest rates I’ve found yet: 10 boards for $9.90 + $3.90 shipping, for only $13.80. Of course, the shipping is from China, so even air mail may take a while, and I don’t know what their turnaround time is for orders. They also have small-batch orders that are even cheaper: $45 for 50 boards, $75 for 100 boards, making this very attractive for classroom use. Of course, if the board gets just a tiny bit bigger, the price doubles or quadruples, since they have a 5cm×5cm bounding box for this price. This will be the 4th different PCB prototype service I’ve tried. The others are 4pcb.com (good service, USA made, but a bit pricey), batchPCB (a little slower, but cheaper, probably from China), and OSH Park (USA made, cheap if boards are tiny or you need 3 copies , accepts Eagle brd file, don’t know how fast yet). I think that someone using Eagle for design might do best with OSH Park, since learning how to use Eagle to produce the Gerber files needed by the other fab houses was a bit of a pain. iteadstudio does provide Eagle design-rule check and CAM files, but they seem to be pretty much the same as the default Eagle ones—I’ve not gone through them carefully to see if there are any subtle changes. They do have the most awkward way for delivering the Gerber files, requiring that they be e-mailed as a zip file, rather than accepting upload over the web like the other services. Worksheet for designing layout. This PNG image is a little small, but Eagle can make a PDF output that is big enough for easy layout. I improved the top documentation layer, so that the combination of the documentation and top silkscreen make a useful worksheet for students to design their layout on. If printed at 3.5× real size, the worksheet fits nicely on a page and leaves room in each resistor for adding a value. I tried a couple of slightly different layouts for the EKG blinky circuit with optional Arduino output, and it seems to be fairly easy to lay out. The hard parts for students will be coming up with the circuit design and soldering it up without shorting adjacent pads. I’ll have to write up some documentation for the board, to explain the options for power (from an Arduino, from a DC power barrel, or from screw terminals; whether an RC filter is added to the power input or not; where the power and Gnd connections are available on the board, …). I’ll probably also have to write some assembly/soldering instructions for the parts of the board that aren’t student customized. Last night my family went to opening night for Twelfth Night at Shakespeare Santa Cruz. I’ve seen a number of different productions of the play over the past 40 years, and this was neither the best nor the worst of them. Paul Vincent O’Connor was probably the best Sir Toby Belch I’ve seen. He was appropriately coarse and rowdy, but tender with Maria (a facet of the character often missed). Jerry Lloyd did an excellent job as Malvolio. Malvolio’s monologue on finding Maria’s forged letter is one of Shakespeare’s best comic monologues, and Mr.Lloyd played Malvolio’s overweening self-importance well throughout the play. William Elsman as Sir Andrew Aguecheek had the upper-class twit part perfected. His comedic timing was excellent. Jason Marr did a good job in the rather thankless role of Fabian. I hope we see him in a meatier role in future. The twins looked at least vaguely similar to each other (though not so close that they were hard to tell apart). Too many productions rely entirely on costuming to make twins of an actor and actress who look nothing like each other. Shannon Warrick as Maria seemed to take real delight in her jokes and made the Maria’s affection for Sir Toby seem real (rather than a rather crude play for money or social standing that is often done). She should have been made up to look a little older, though. Good voice projection. A few years ago there were some SSC productions with actors who couldn’t make themselves heard. Although I’ve gotten deafer in the intervening years, I had no problems at all hearing these performers even at their quietest. The costuming. There were some good touches (like Malvolio’s chain of office with his bathrobe and Sir Toby Belch’s foot brace), but for the most part the costuming seemed irrelevant and distracting—ideas thrown together without much attention to whether they worked well with each other. Olivia’s slit skirts were unflattering and made her look more like a strumpet than a countess. Feste’s drab costume seemed inappropriate for a fool (and Mark Christine’s rather flat performance of Feste didn’t help). Some costume choices just seemed bizarre and pointless, like the horsetails on an umbrella frame for Olivia. The music. Feste had a nice enough voice, but not one to write home about. The addition of a parody of the twelve nights of Christmas to the catch scene was gratuitous, adding nothing to the play, and the arrangements of the music were mostly lame. Of course, I’ve been spoiled because at one of the first productions I saw of Twelfth Night (over 30 years ago in Berkeley) Oak, Ash, and Thorn sang all the songs alluded to in the play before the play and during the intermission. (I don’t know if the current Oak, Ash, and Thorn group has the same singers, but they’re about the right ages.) There are a lot of references to popular songs of the day in the play. I would have also liked to see a little dancing: Sir Toby attempting a cinque pas for the line “I would not so much as make water but in a sink-a-pace” (for that matter, doing a few seconds of each dance mentioned in that speech). Again—I’m spoiled by that Berkeley production. The mixed concept. The director tried to mix a set based on Tim Burton’s art, costumes sort of from Cirque du Soleil, and a few steampunk props. Any of these ideas could have worked if followed through, but the half-hearted mixture of them was not successful. I think that a fully steampunk version would have worked best, but perhaps their costumers and prop makers were not up to the task—Orsino’s steampunk bow was amusing, but the single bicycle sprocket on Andrew Aguecheek’s carpetbag was just pathetic. The makeup. The clown makeup was distracting and added nothing to the performance—they would have been better off with ordinary stage makeup (except for Feste, of course). I thought that the Shakes to Go performance that I saw on June 8th (the final performance of their 27 performances this year) used the clown makeup more effectively. Perhaps the minimal set necessitated by the Shakes to Go traveling show lends itself more to the clown approach. Or maybe Patty Gallagher is just a better director than Marco Barricelli. Overall, the production was a good, crowd-pleasing one, well worth seeing, even if not the finest work Shakespeare Santa Cruz has ever done. I was just reading the College Board report today that looked at whether high school GPA, SAT score, or both was the best predictor of first-year college GPA: Students with Discrepant High School GPA and SAT Scores. The interesting thing about this particular study was that they separated the students into 3 groups: those for which the SAT and HS GPA said the same thing, those for which the SAT was much higher than expected from GPA (smart but lazy? rebellious? ), and those for whom the SAT was much lower than expected (slow but teacher pleasers? bad test takers?). The correlation with first-year GPA was not good for any of the predictions (highest R2 value was 0.232 for regression using both HS GPA and SAT scores with the group for which the two predictors were in close agreement). The worst predictions were for using the high-school GPA when it it was much higher than the SAT (rampant grade inflation? )—only R2 0.127. What interested me was that for both the “discrepant” groups, the lower of the two measures was the better predictor of future performance. That raised an immediate question for me, which unfortunately the unimaginative researchers at College Board did not consider: how good a predictor would the minimum of the HS GPA and SAT score (both converted to Z-scores) be? My guess is that it would be a better predictor than either alone, and probably better than the standard linear regression of both. But I have no access to any data to confirm or refute that conjecture. I suspect that success in college is best achieved by those who have both brains well tuned for test taking and a willingness to work within the system, so that a low SAT or HS GPA limits performance in college. The minimum function serves as an “AND” operator, in a way that linear regression can’t really mimic.